Our ever-growing community of young people is motivated to support more inclusive societies. They all agree that the negative perceptions of migration should be counterbalanced by sharing the real experiences of the young generation. They feel they can’t find a way to meet migrants and share their experiences together, often because societies in Europe nowadays are demonising and separating youth from each other. 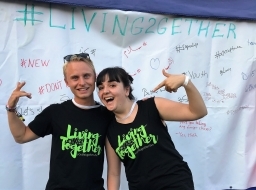 Youth believe that Living Together has the potential to break this and connect them together. Help Living Together to reach more people with their message by sharing this video and donating for its promotion here.